Whether you’re an existing customer or looking at greenfield opportunities, Oracle solutions can be a little overwhelming when you’re trying to pick the best business application for the job. As an Oracle Cloud Managed Service Provider (MSP) with a deep and long history of implementing Oracle solutions for our customers, we’ve found the best way to pick the right product is to define the problem and your business objectives. From there, you can align it with the best Oracle offering. It’s still a big job, so we’ve put together a little guide to help customers get started, whether you’re eyeing new computing infrastructure or business applications. If your goal is to improve productivity for users and scale up your business to be more competitive while reducing costs, you’ll want to start with Oracle Cloud. Moving to a subscription model automatically lowers your costs because for a monthly payment you have access to a wealth of infrastructure that would have otherwise required a great deal of upfront investment on your part. Not only you do you save money on hardware, but you immediately have more business flexibility. Managed Oracle IaaS enables you to move all your business applications to the cloud, which minimizes the disruption that usually comes with on-premise system upgrades or software changes. Oracle also offers a great deal of business applications you can run in the cloud. 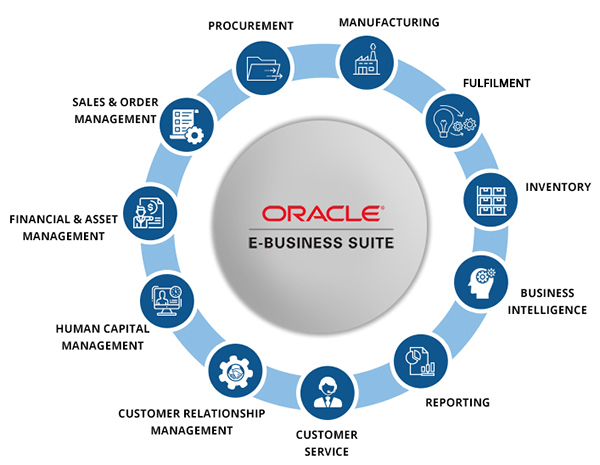 If your aim is to gain greater visibility and improve profitability, you should consider Oracle Business Intelligence, Oracle Supply Chain Management and Oracle E-Business Suite to drive smarter decisions through analytics, improve workflows and employee productivity. Of course, you can’t make smarter decisions without the right information, so if you’re looking at corralling your data better, there are a few Oracle solutions that can help. One the realities of today’s business is that you have multiple systems and applications that ideally should be using the same data—that’s where Oracle Middleware comes in. It can help you pull together files and datapoints to provide the single source of truth business applications need to deliver value. An Oracle Database, meanwhile, can help you harness customer information. Your mission critical data and business applications only deliver the most value when they have a solid foundation supporting them. Oracle offers several hardware and infrastructure options that make sure data-driven business applications operate optimally while also helping you to streamline costs. Oracle Virtual Machine, for example, can help you reduce your overall compute costs. But if you want to not only improve your compute performance and maximize return-on-investment from your Oracle applications, you should consider an Oracle engineered system such as the Oracle Database Appliance, or Oracle Exadata, which provides even more power with less maintenance. Whether it’s just a couple of Oracle solutions or a large combination of business applications and Oracle engineered systems, you can pull everything together with Oracle Enterprise Manager, which provides a single view of all your Oracle deployments in a central location. The breadth and depth of Oracle solutions doesn’t have to be overwhelming. Whether you’re an existing customer or eyeing Oracle for the first time, an experienced technology partner can help you adopt and update your business applications so you can scale your business while reducing costs. Fabio Gross in senior channel manager with Supra ITS. Learn more about Supra ITS’ status as an MSP with our handy FAQ.